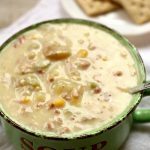 Instant Pot Clam Chowder–a thick and creamy chowder with bacon, corn, potatoes, celery and minced clams. Make it fast in your electric pressure cooker! My 1o year old son has been begging me to make clam chowder for ages. He loves it and likes to order it when we go to restaurants. The janitor at his school, Rick, apparently also really likes it. Skyler begged me to make a batch that he could take to school and share with Rick. I thought that was pretty cute. So I made this Instant Pot clam chowder at 9 am yesterday morning. It turned out awesome! Skyler said that Rick loved it too. I got this recipe from my sister, Alicia. She made it for my blog way back in 2010 as a slow cooker recipe. It’s just as good as an Instant Pot recipe. I think you’ll really love it too! To make Instant Pot Clam Chowder I used my 6 quart Instant Pot Duo 60 7 in 1*. I love this Instant Pot because it has the yogurt making function which I use almost weekly. It has two pressure settings (high and low), and there are also little slots in the handles so that you can rest the lid there instead of putting it down on your counter-top. 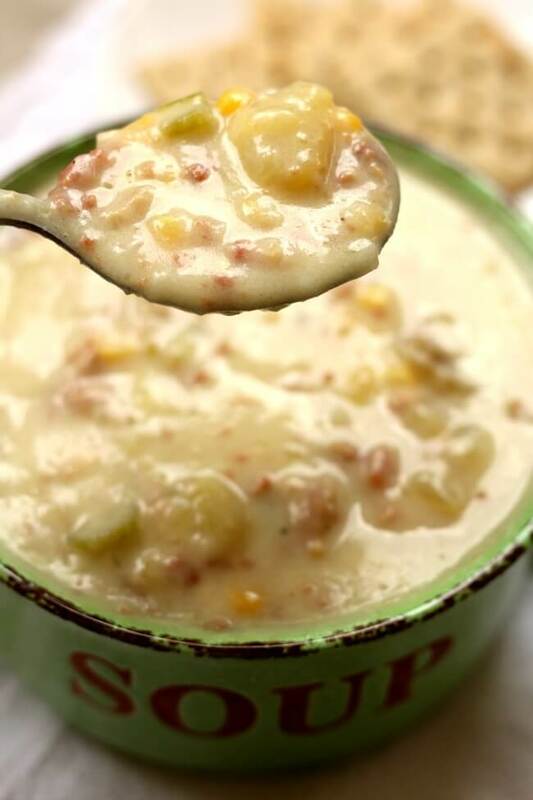 A thick and creamy chowder with bacon, corn, potatoes, celery and minced clams. Make it fast in your electric pressure cooker! Turn your Instant Pot the saute setting. When the display says HOT add in the oil and swirl it around. Add in the onion and saute for about 3-4 minutes, until onions soften. Add in the water, potatoes, clams with the juice, corn, bacon and celery. Cover and secure the lid. Make sure valve is set to sealing. Set the manual/pressure cook button to 4 minutes. Once time is up let the pot sit there for 5 minutes (the display with read L0:05). Then move the valve to venting. Remove the lid. Warm up the milk and half and half in the microwave or on the stove. It should be warm. Stir in the melted butter. Then very slowly whisk in the flour a tablespoon at a time. It should be lump free. Then stir this mixture into the Instant Pot. Turn the Instant Pot to the saute setting. The milk/flour mixture will thicken the chowder in a few minutes. Stir constantly (for about 3 minutes) so that the bottom doesn’t burn. Taste the chowder and then add salt and pepper as needed. I used yellow potatoes and didn’t peel them. To make gluten free: Omit the flour and replace with a cornstarch/water mixture to thicken. Combine well before adding to soup. 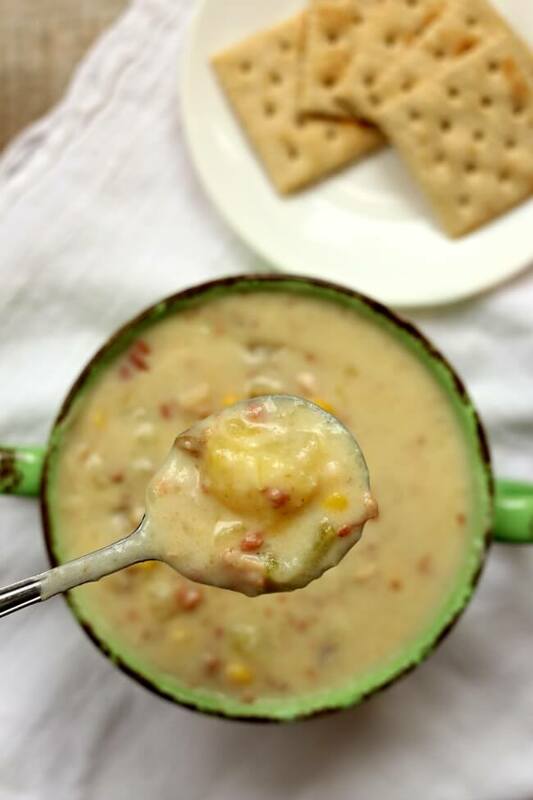 Like this recipe for Instant Pot Clam Chowder? Get all my new recipes delivered to your email inbox by signing up below. Thanks Ashley I’m so glad to hear this. Craving clam chowder and made this last night. It was so good. I went with three cans of clams & juice instead of the suggested two. More clams and more clam juice. For those wanting more clam flavor, this may be an option. My glass of wine with the meal, didn’t hurt either. glad you liked it Ken! Thanks for sharing your tips! It was tasty and pretty easy to make. I had to add a lot more salt than I thought I would need, but once the salt was right, it was delicious. Our only complaint was that it was not clam chowder. 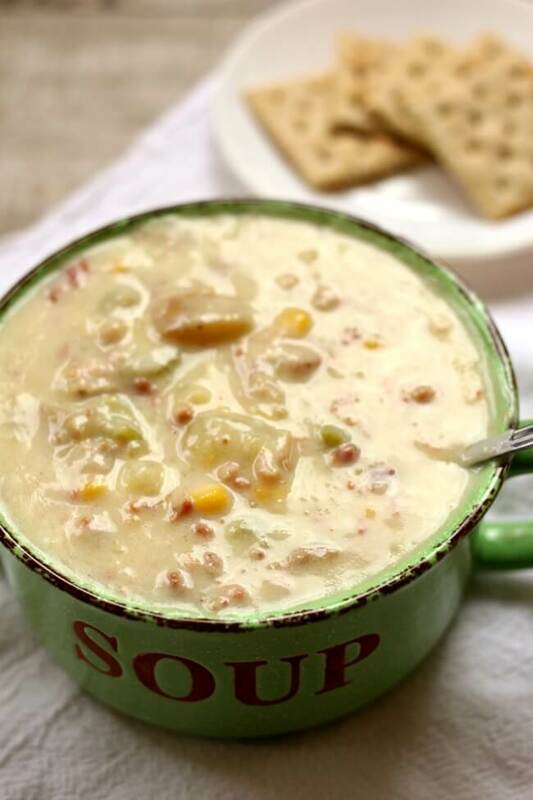 It tasted more like corn chowder, which we also like, so it worked out. Next time I will try a more expensive can of clams and maybe use clam juice instead of water. What is the pressure to cook this at- I assume high ? I see so many recipes that fail to list this. Thank you for all your wonderful recipes you are my go to for any instapot questions !!! yes, it’s high. I always just high. It’s the default setting on my Instant Pot. If I used clam juice instead of water would that be “too much” and make it too “fishy” tasting? I am really not sure. I bet it would be okay! Made this tonight and it was very good. My only problem is I’m the only one in the house that likes Clam Chowder. Any thoughts on how to store the leftovers? I assume it can’t be frozen because of the milk? It might be okay frozen but sometimes dairy gets weird. I would store in airtight container in the fridge for up to 5 days. I’d like to make this for new years eve. But I need a larger batch. do you have a recipe that yields enough for 6 – 8 people? It’s ok if there are left overs. I would just double this recipe. You can keep the cooking time the same. This recipe was so quick and easy, yet it tasted like it took hours to make! My husband loves clam chowder and he couldn’t get enough!! The flavors melded so well together. I was so confused by the flavorless comment, the recipe clearly states to add salt and pepper as needed, and that was literally all this recipe needed. Creamy and delicious, I was so happy with how this turned out and I will be making it all winter long! Clam chowder is my favorite soup/chowder. I made it for the first time using this recipe. My whole family could not stop eating it and ask for seconds. I had to make a second batch. On the second batch I used bacon and sauteed it for the fat to begin and doubled the clams. Love it! So glad to hear this ! No stars – this is flavorless. Not enough clams, too many potatoes. Don’t waste your money or time.